Want to honor Julie & Robin Kerry? Click here to change the world. Published in 2004, A Rip in Heaven is Cummins's bestselling account of a horrific violent crime, and how her family endured unimaginable tragedy. It was nominated for the Gateway Reader's Award. Cummins recounts the wrenching drama in a straightforward, expertly paced narrative that reads like a novel. For someone so closely related to a crime victim to strike such a fine balance in chronicling it is a highly admirable feat. Cummins’s noble account will ultimately draw readers into all sides of the story. A stringent commentary on our society’s fascination with killers, who in media coverage often overshadow their victims. Cummins’s memoir does a good job of retrieving the lives of Julie and Robin from that obscurity. Click here for updates on the people and events from A Rip in Heaven. 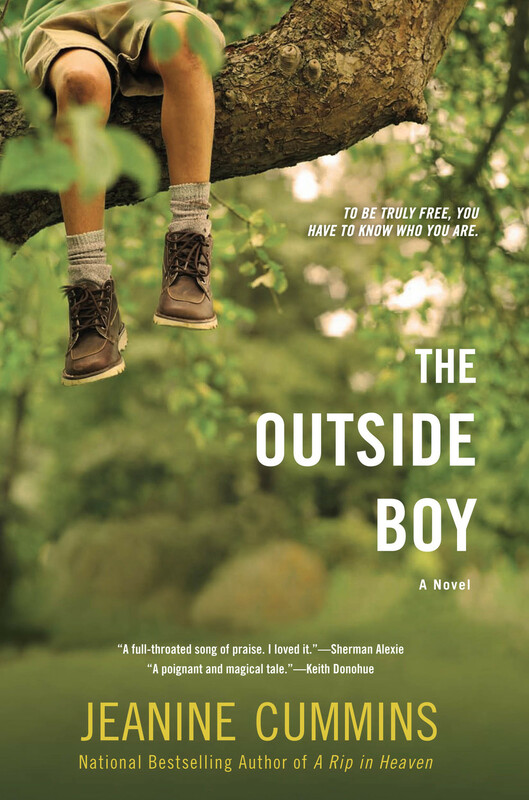 Published in 2010, The Outside Boy was Cummins's first novel, set in Ireland in 1959. It was an Indie Next Pick and winner of the Booklist Editor's Choice Award. The Outside Boy is such a powerful read. I identified so strongly with this story of a strange and gorgeous and vanishing way of life. It’s an adventure, and, yes, a eulogy, but it’s also a full-throated song of praise. I loved it. ...the modern diminutive hero Christy, in Jeanine Cummins’s gloriously poetic novel, will burrow his way into your heart. It’s not often I hug a book, but with moist eyes and beginnings of a song in my heart, I followed Christy’s journey from a death to hopeful life. The Outside Boy is gorgeously written and an implicit celebration of Irish storytelling. Do not be surprised to see this novel on a few “best of the year” lists. Wonderfully written, with strong, compelling characters, it is a deeply satisfying combination of sweeping historical saga and modern family drama, a gentle reminder of the ever-reaching influence of family. ...two engrossing tales that work in concert and also stand on their own…Cummins’ well-researched, lively prose brings the two together into a bittersweet whole with a satisfying and emotional conclusion. ...lyrical, emotional and often funny. This extraordinary novel reminds us how motherhood can make us feel as though we are coming undone while also being remade.